How well do the air cars perform? CALL them air cars. Call them ground effect vehicles. Or call them air cushion sleds. â€¢ How can we make them fly high enough to clear rocks, fences, high waves and other obstacles? â€¢ What is the best way to steer them? â€¢ Will they perform adequately at high speed, if at all? Answers are being found, although to date, there appear to be no “best” answers. This despite the fact that a lot of money and time have been spent by private individuals, large companies and the United States government, in the hope of some day having a vehicle that will ride comfortably and economically, a few feet off land or water, and over all obstacles in its path. Even the two air cars now being offered for sale by Curtiss-Wright Corp., Wood-Ridge, N. J., might be termed experimental, since their performance is somewhat limited (altitude of the smaller model is only 4 in., that of the larger one 6 to 12 in.) and the company says they are offered for “off highway use,” which bars them to hopeful commuters. brothers, air cars come in various shapes and sizes, but they all work on the same basic principle: Air is pulled into the vehicle and blasted out by a propeller through its bottom against the ground, creating a supporting cushion of air on which the car floats. This is simplicity itself. In fact, one experimenter says it is virtually impossible to build an air car that won’t get off the ground. The simplest form is the plenum chamber type (Fig. 2A), which resembles an upside-down pie tin with a propeller mounted on top. Most researchers have started with this type, then moved on to the more sophisticated peripheral jet (Fig. 2B). Findings so far show that the peripheral jet type can achieve higher altitude (given equal base areas, horsepower, and weight) than can the plenum, since its directed air jet both builds and confines the cushion. Merely getting the vehicle into the air is not sufficient, however. We must be able to control its direction for going forwards, around corners, up inclines and over obstacles. And this is where the present crop of air cars falls far short of the ideal. Because relatively little is known about the problems raised by an air car in forward flight, researchers are trying several different steering techniques. Some Use Body-English. The most elementary method is plain old body-englishâ€”or kinesthetic control. Princeton University built its air scooter expressly to test the feasibility of such control (Fig. 4). Its handlebars are merely for the driver’s support; he leans in the direction he wants to headâ€”thus tilting the air car and the angle of its lift vector (Fig. 5), using it for horizontal thrust (just as a helicopter tilts the lift vector of its rotor for forward flight). Similar to this is the second method, which obtains tilt from controllable flaps or vents in the peripheral jet. Probably the best-known example of this method is the Aeromobile, built by an Illinois doctor, William R. Bertel-sen (Fig. 6). A third method bleeds off part of the air from the propeller andâ€”by sending it out through horizontal openingsâ€”uses its reaction thrust to propel and control the air car. An example of this approach is the Hovercraft, built by Saunders-Roe, Ltd., of England. About 70% of the air generated by its power supply (a 4-blade propeller powered by a 450-Tip engine) is used for the air cushion. The remaining 30% is used for propulsion, blasted out through ducts at the corners (Fig. 7). On a smaller scale, the air scooter built by Bell Helicopter Corp., Fort Worth, Tex., uses a combination of the body-english and horizontal duct methods (Fig. 8). To go forward, its driver depresses a foot pedal, opening louvers in the rear of the vehicle. To move in another direction, he turns the handlebars (thus directing thrust out of diagonally-located ports) and applies body-english in the same direction. The Bell scooter, by the way, is an outgrowth of research carried on at home by two Bell engineers, Ken and Rod Wernicke. After they built small cars capable of carrying their children, and a larger one on which both the men could ride, Bell authorized a project to perfect and build the vehicles. Other propulsion and steering methods call for a secondary supply of power, such as a conventional air propeller, a ducted fan, or a jet or rocket engine. â€¢ All of the air supply is used to build the cushion. None is bled off through ducts for propulsion. â€¢ The driver does not have to resort to body-english, but can sit comfortably and use a control stick. â€¢ Local thrust control makes possible easy trimming of an off-center load. How High the Air Car? At present, the most critical shortcoming of the air cars is their limited altitude. To be really useful over all terrain, they should be able to clear fences, logs, boulders and bushes and climb whatever hills they come to. But the Hovercraft moves at most a foot above the ground, Bell’s scooter only 2-1/2 in., Princeton’s about 3 to 4 in. and Dr. Bertel-sen’s about 6 in. Such performance limits their operation to relatively smooth surfaces (when an air car traveling 2 in. up meets a log sticking up half a footâ€”crash!). How can they be made to go higher? Some researchers add skirts to the base. Thus, although the car itself goes higher, the effective baseâ€”that is, the bottom edge of the skirt â€”remains close to the ground. One home workshopper uses a long polyethylene skirt (Fig. 3) which enables the car to cruise 26 in. up. As with many of the air car experimenters, though, he is not giving away details on exact performance of his car (for example, what happens to the skirt and the air cushion trapped inside it when the car sails over a fence? ), since in many cases patent rights and the possibility of great profits are involved. 1) Increase the base area of the machine. 2) Boost the power. Let’s consider for a moment something called lift-augmentation. This is the amplification of thrust found near the ground. In other words, the closer to the ground the air car is, the greater lifting capacity it has. Also, lift capacity increases as the base area of the car is increased. Thus, simply by building the vehicle larger, you get more altitude for the same power input. Conversely, by keeping the base area the same (or even reducing it in size) but boosting the power, you can also gain altitude. But going up too high means that the air car might hover at an altitude where maintaining static stabilityâ€”the tendency of the vehicle to right itself to a level attitude after being tilted by some external forceâ€”becomes a problem. The peripheral jet air car appears to be inherently stable up to an altitude of about 5% of a base diameter, according to Princeton University researchers, although the use of additional jets in the base can add to its stability (Fig. 9) at higher altitudes. Thus, if you rely on size alone to gain altitude, any air car big enough to clear fences and hedges probably would be too big for use on narrow streets. On the other hand, the alternative (making them no bigger, but boosting the power) adds greatly to the cost. The only apparent solution is to build different models for different purposes: Small, low-altitude cars for city use and bigger ones for overland travel. What About Speed? Another sticky problem is speed. So far the maximum speed of the experimental air cars has been in the neighborhood of 30 or 40 mph, although the Curtiss-Wright Bee (a 12-ft. long, 1,115-lb. model, powered by a 100-hp engine) is said to reach 53 mph. Bear in mind that these speeds are achieved at quite low altitudes, a matter of several inches. What nobody is really certain of is exactly what happens to the supporting air cushion at higher altitudes and higher speeds. 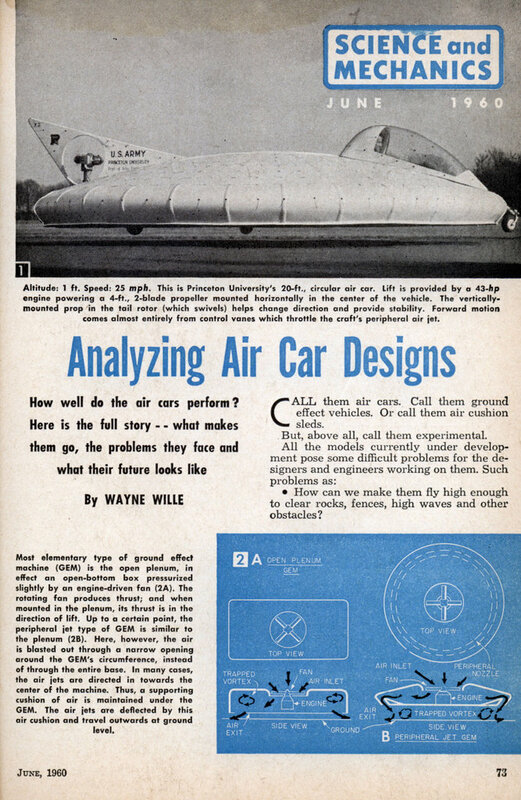 In some tests, the air cushion appeared to break down at both high speeds and high altitudes. In others, it actually showed a gain in lift. It is believed possible that different designs might be needed for most efficient opera-tion at different speeds. Ford Motor Co.’s experimental Levacar is expected to reach speeds from 200 to 500 mph. But, although it also slides on air, it can not be called a ground effect vehicle. In its case, a thin film of relatively high pressure air is used to hold it a fraction of an inch from guide rails. Steep inclines present another hazard, and the air cars developed so far have a very limited hill-climbing ability. Bertelsen’s will take a 6% grade, while Bell’s will climb 10%. If the car assumes the tilt of the hill, the lift vector is also tilted and has a strong downhill component which has to be overcome. So to climb a hill, the car has to out-tilt it, tilt opposite to the slope and climb on its own lift; the horizontal component of the lift vector is then in the uphill direction. Finally, the dust and spray created by the jet of air when the car goes over dusty surfaces or water present a bad problem. Hovercraft researchers, for example, found that during a two-hour operation over the sea, they got as much as 1/4-in. of salt on the cylinders of their engine from the spray. They have found, however, that the addition of spray rails to the base can solve this problem. To reduce the dust raised by overland operations, you can lower the velocity of air being blasted through the peripheral jets. But to do this, while maintaining lift and altitude, you have to move a greater quantity of air through wider jets. â€¢ A “flying truck” for operating overland in bush, tundra or desert. â€¢ A “snow freighter” with living accommodations for freighting or polar exploration. â€¢ A “tramp saucer” for coastal work in places where there are few harbors. â€¢ A “river rider” for transport and ferry work on frozen, un-navigable or fast-flowing rivers. All of these vehicles will be enormously larger than the 7,500-lb. prototype car shown in Fig. 7. The company also is projecting its hopes farther into the future with a suggested design for a 400-ton ferry (Fig. 10). As mentioned, Curtiss-Wright is already offering two air cars for sale, and another large corporation is known to be considering sale of a lower cost model. Most likely, though, the first air cars you will see in every day use are the more efficient bigger ones, in use as trucks, freighters or buses. The smaller onesâ€”carrying only one or two passengersâ€”will be restricted for some time to off-high way uses (although not oft-smooth surfaces). Air Boats? One possible future application of the ground effect principle that has received relatively little attention is its use in boating. National Research Associates has carried out some tests, in which the air cushion was used to reduce drag rather than provide high mobility. 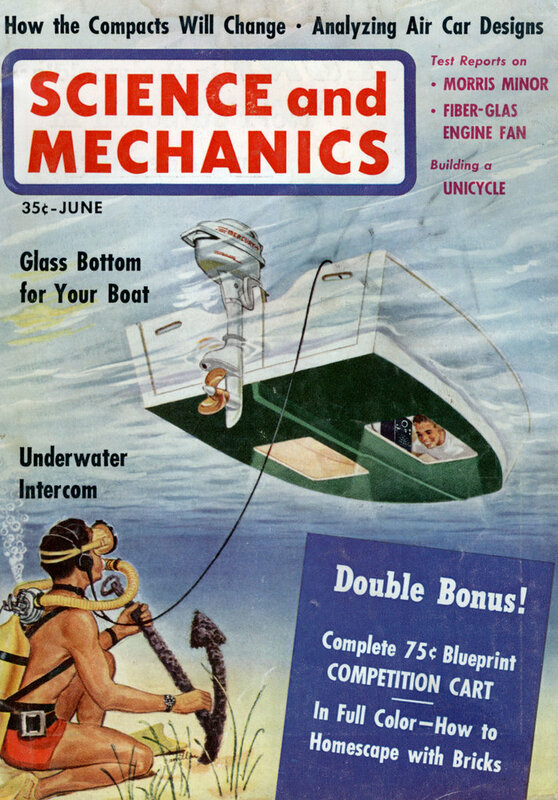 Their tests were made with an 11-ft.-long boat, powered by a 5-7ip outboard motor. An air cushion was provided by blowers driven by a separate 2-1/2-hp engine. Without the cushion, the boat had a top speed of 5 knots. With the cushion, the speed increased to 17 knots, and the boat gave a smoother ride over choppy water. More tests are now being conducted, and the air-cushioned boat seems to have a bright future. I want them all so bad!!! #4 is the coolest thing I’ve ever seen, however.